Whenever I go sailing, one of my goals is to cross the finish line with a feeling of satisfaction. It�s nice to finish first, but for me, sailboat racing is most rewarding when I�m learning can definitely learn something every time I go out on the water. As long as I follow this simple strategy, I�ll always be a "winner." As Dr. Stuart Walker once said, "Winning may be the object of the game, but it is not the object of playing the game." To me, the object of playing the game is to have fun, do your best and learn something that will improve your performance the next time you race. Diversify. Race as many different boats as possible. this is not only fun and a great way to meet new people, it�s very educational. By sailing a variety of boats, you get a fresh perspective on sail trim, boat handling, and tactics. You�ll almost certainly discover little tricks and broader sailing principles that you can apply to make your own boat go faster. Become a spectator. Some-times I think we can learn more from watching a race than from sailing in it. The reason is that spectating allows you to look around a lot more. Instead of being mesmerized by the telltales, you suddenly have time to notice how other people are trimming their sails and how the top boats are sailing the first beat. This will also help you maintain a better overall perspective while racing. Better yet, have someone videotape you while you are racing. Practice with two boats. One of the quickest ways to steepen your learning curve is by putting yourself into a structured situation with one other boat. A few years ago I went one-design sail-testing and sailed upwind for literally 10 miles with another boat. Besides making program on sail shape, we learned a lot about steering, weight placement and sail trim. Of course, you don�t need a whole day for two-boat testing. It�s easy to hook up with another boat before the start of your next race. Just make sure you do this with someone who, like you, is interested in learning and will share information honestly. Imitate the good guys. As the old saying goes, you don�t have to reinvent the wheel. So keep your eyes on the boats at the top of your fleet. How do they tune their rig and trim their sails? What are their tacking and jibing techniques? The quickest way to be successful is to copy the top sailors as closely as possible. Once you have confidence in your own speed and smarts, you can start trying a few of own theories. Crew for the best. Take every possible chance to get into racing situations with sailors who are more skilled than you. My own abilities have improved greatly while crewing for people like Dave Perry, Buddy Melges and Dave Curtis. The best way to approach this is to pick a few people you�d like to sail with. Let them know you�re psyched to sail with them whenever the need a crew. Of course, you don�t have to sail in someone else�s boat. Invite a few top skippers (from other clubs or classes) to skipper your own boat sometime. You may be surprised, at the positive response. Think ahead about the questions you want to ask. A little planning will help you figure out what you really need to know and will let you benefit the most form your time with the hotshot. Be thoughtful about timing. Before a race, most top sailors are busy getting ready or being nervous. So wait until after you get in. Remember that race winners are usually deluged with questions and congratulations; you�ll get more attention from from the sailors who finished second and third. Don�t forget crews. They often know more about subjects like sail trim and boat handling than their skippers. Crews may have more time to answer questions, and they are usually happy to be asked. Be a teacher yourself. There�s an old adage that says no one learns more than the teacher. This is definitely true in sailing. In fact, some people argue that you don�t really know something until you can explain it to someone else. So look for opportunities to share your knowledge. Offer to go sailing with new people in your fleet. Write an article for your class newsletter. Volunteer to give an instructional talk to your club�s winter meeting. Some of these ideas may seem scary, but they will definitely push you along the road to becoming an "expert." And you�ll feel good about contributing to the sport. 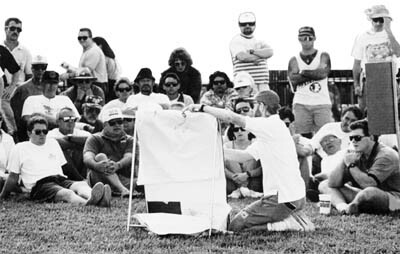 Attend or organize a seminar "Hands-on" sailing seminars offer the best way to make quantum leaps in your racing skills. They�re a great opportunity to actually get coaching on the water. For this reason, keep your eyes and ears open for seminars. Since there aren�t too may of these around, you may have to organize a clinic yourself. Get your club or fleet members together and contact your sailmaker or class champion to set up a date. If you do this a couple times a year, you�ll be amazed at how much everyone learns. Remember, the better your fleet members become, the better you will be. Watch your mental re-runs. This may be my favourite technique, and it definitely works. Whenever Ihave a little time to daydream (e.g. when going to sleep at night), I replay recent races in my mind. I go through a race from start to finish, remembering as many details as possible. This is important for two reasons: 1) it reinforces lessons learned from good moves and errors I�ve made; and 2) it helps me store race experience in my mind so I can draw on it in future situations. � Boatspeed ideas - how to improve sail trim, rig tuning, etc. � Wind and weather - your strategy, what the wind did, etc. Start a photo library. I bought a new boat a couple of years ago and put most of the fittings on myself. One thing that helped me a lot was that I had taken photos of the layouts on some of the top boats in the class. Even if you�re not planning to get a new boat soon, bring a camera to regattas. Take pictures of good ideas on other boats, and keep these in a photo album for future reference. This will help you stay abreast of the latest tuning and rigging ideas. Besides, you never know when you may decide to re-rig your current boat, or perhaps splurge and buy a new one. Be a sponge. Anyone who is serious about becoming a better sailor must absorb information whenever possible. 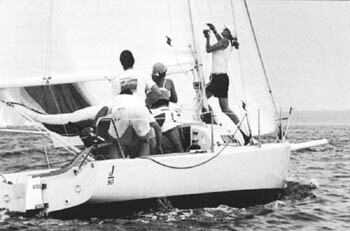 In the world of sailboat racing, there is a wide range of instructional magazines, how-to-books, videos, even computer simulators. Make sure you have up-to-date copies of the racing rules of sailing, the ISAF cases, the appeals decisions of our national authority, the system, your club sailing instructions and so on. Read these through when racing is called off. You�ll be amazed at how much you can learn. Join. Join. Join. Become a member of your national sailing authority and your class association (if you race a one-design). These organizations have good newsletters and other benefits that can be very valuable for your racing success.